While spring and summer (for what concerns the mountains) are definitely the blooming seasons, some minor events with flowers happen almost all the year round. 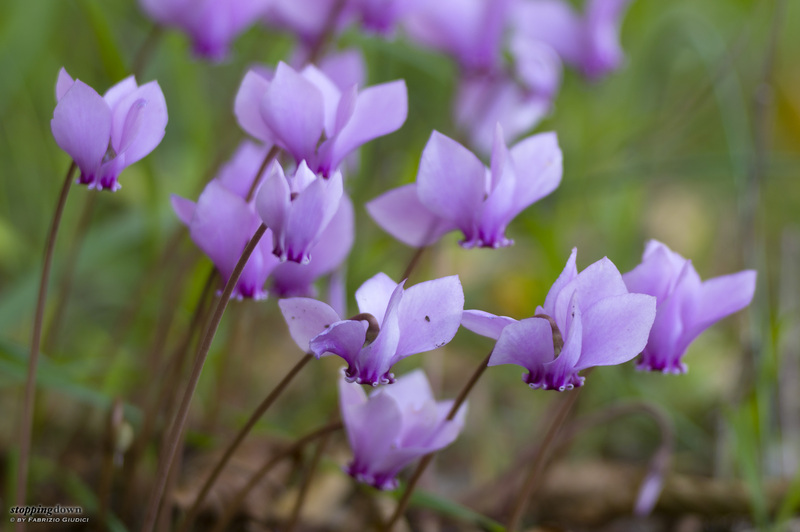 For instance, a species of cyclamen in the Mediterranean area starts blossoming at the end of the summer and keeps going on for some time through Autumn. 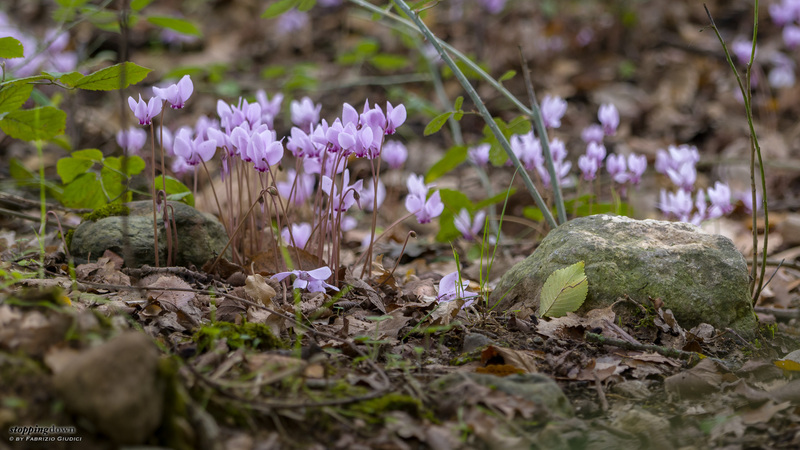 During a short journey near Siena I found that the undergrowth was often packed with blossoming cyclamens, as well as the top of many dry stone walls at the borders of the road. Sony NEX-6 + Meyer-Optik Görlitz Trioplan 100mm ƒ/2.8 @ 100 mm, 1/20 sec @ ƒ/2.8, ISO 100, Kirk Enterprises Window Mount on the ground. 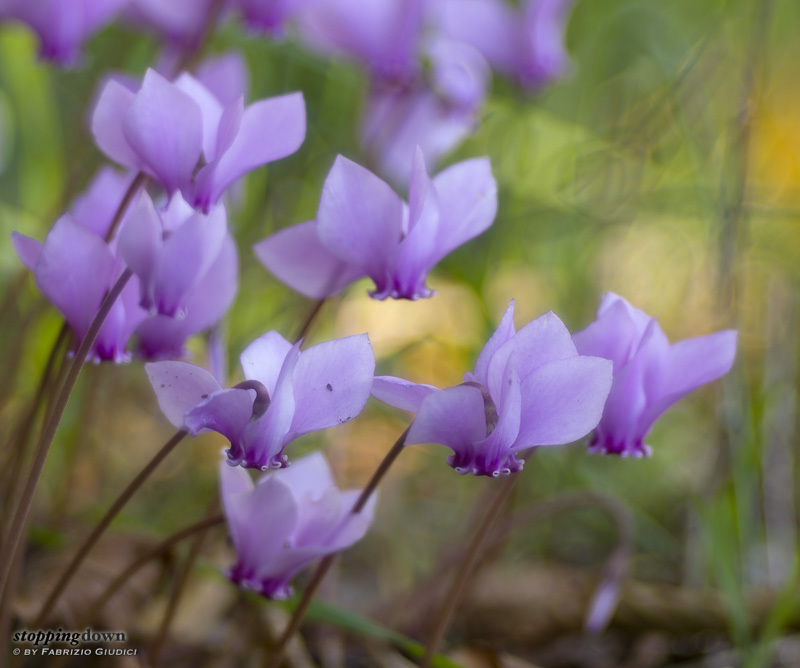 Delicate flowers are best portrayed with the Trioplan, so I worked on cyclamens with that lens for most of the time. Honestly I got a very modest ratio of keepers, because I had some troubles in successfully isolating single flowers from the distracting clutter. In a few cases I stopped down the lens a bit for better depth of field, even though this jeopardised the very peculiar bokeh of that lens. Unfortunately many flowers were dirty with mud because of the heavy rain of the previous evening, and this made many of them not suitable for a good shot. Sony NEX-6 + Meyer-Optik Görlitz Trioplan 100mm ƒ/2.8 @ 100 mm, 1/25 sec @ ƒ/2.8, -0.30 EV, ISO 100, Kirk Enterprises Window Mount on the ground. Sony NEX-6 + Meyer-Optik Görlitz Trioplan 100mm ƒ/2.8 @ 100 mm, 1/25 sec @ ƒ/3.5, -0.30 EV, ISO 100, Kirk Enterprises Window Mount on the ground. For some ambient shots I used the SEL70200G. I realised too late that I should have spent more time with this lens working on the long sequence of flowers on the top of dry stone walls, a very beautiful display that I failed to render. Ciclamini nel sottobosco (Cyclamen hederifolium). Sony α6000 + FE 70-200mm F4 G OSS @ 146 mm, 1/80 sec @ ƒ/4, +1.00 EV, ISO 400, hand-held.